Over-ear and in-ear 'phones for those who like to "have it large"
Purveyors of headphones to the DJ gentry, Pioneer, reveals new headphone range aimed at dance music listeners. In-ear and over-ear lovers are both catered for. Pioneer has unveiled a new range ofheadphones aimed at the dance music market. Our man at the launch, stealing all the canapes, described them as "Pleasant enough in a Beats-by-Dre kind of way, but weirdly quiet and anyway, who in their right mind launches non-noise-cancelling headphones at the Ministry of Sound with really loud, banging music in the background?" The new range that offers both over-ear and in-ear options, with the pick of the bunch being the flagship SE-MX9 over-ear headphones. 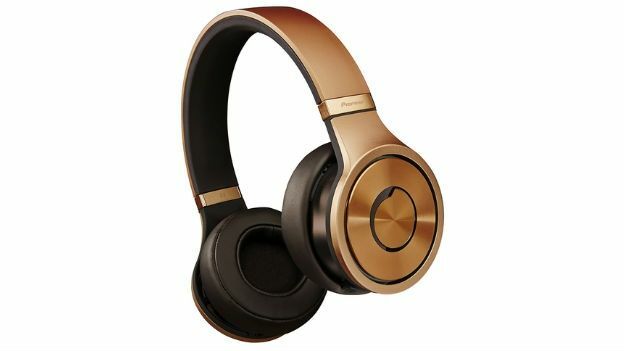 They'll set you back £249.99 and land with a choice of three colour schemes (Bright Copper, Bright Silver or Indigo Black) the 'phones feature twin high performance 50mm drivers. The chunky design tips a nod towards the Beats by Dre stable, but Pioneer is marketing this strictly as a raver's weapon of choice. “Given our reputation in the DJ booth, we are well-placed to create a range of headphones that are for clubbers as well as the DJs themselves," said Geoff Loveday, product manager at Pioneer. "Being so close to the dance music scene, we see how much passion the genre evokes. So we have taken care to design a range of premium headphones that allows users to re-live their favourite clubbing memories though the music they listen to in their own time,” he said. That was our favourite model in terms of looks, sound and VFM were the on-ear SE-MX7. They cost £169.99 and offer up twin 40mm drivers and an earcup-mounted Bass Level Control you know, for controlling the level of the bass. The rubber-like finish on the headband comes in a choice of four matt colours: white, black, blue and a rather fetching orange. If in-ears are more your thing, then you can pick up the new SE-CX9 and SE-CX8 for £249.99 and £169.99 respectively. Both are equipped with an in-line mic and remote control for taking phone calls, but the CX9 features a built-in Balanced Armature Driver compared to the CX8's regular dynamic driver. We didn't try them out as we didn't know whose ears they'd been in and frankly some of the assembled throng of middle-aged hi-fi hacks and thrusting young hipsters in ironic hats looked a bit mucky. All models will launch in April and will be available to buy either from Pioneer or selected retailers. In the meantime, check out our best headphones to buy in 2014 feature.